The pinch-out gesture results in a Citation View with all cited documents listed in a single column. (A question is still how to integrate glossary terms but I’ll have to freeze that for now–skip ahead to later thinking and this becomes a separate issue). What is important is to be able to show citations in a loose and ordered manner (timeline etc.) with a good interaction to toggle between them and somehow annotate/present them with the concepts they represent. So how can we build a system where the main aim is to allow the author to provide a multidimensional view of the concepts they are discussing in the word processing view, with reference to the citations affecting the concepts being connected? The few which really informs the document–will they be the same as the headings in the document though? Probably not. Glossary Terms, which will continue as currently implemented; outside of the document (stored on WordPress) but linked through cards etc. Concepts as annotations in the Citations/Concept view. 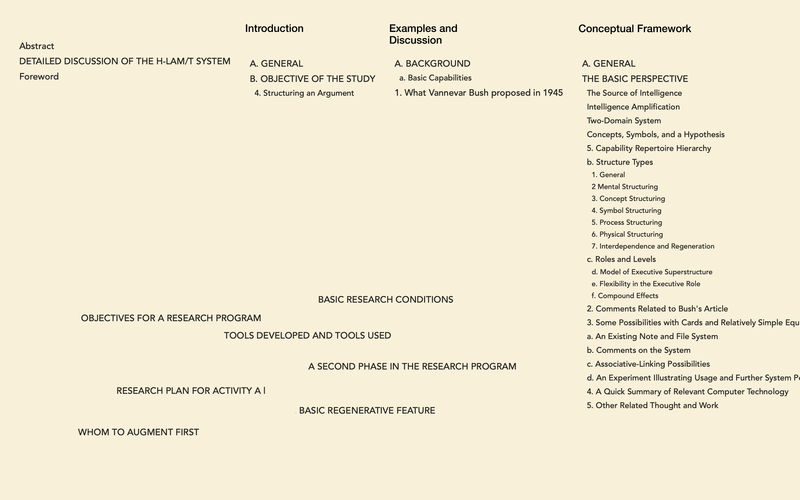 The concepts making the shape of the document–the really big ideas–are not the same as the Glossary Terms but are they the same as the Headings? Probably not, since the Headings include such things as ‘Introduction’ and ‘Conclusion’ etc. Let’s flip it: The pinch-out gesture becomes the Concept View where the user can choose to also view Citations, but how? There is no mechanism for creating or tagging text in the word processor view as Concepts, though of course that can be done, and it’s unlikely to have been done before entering pinch-out. Maybe a sub-set of the headings are useful as Concepts? Maybe the smallest, level 6? Maybe create a new level, level 7 which will be Concepts but will show up in TOC and Concept view and word processing as normal but bold text? What about letting Concepts live in the Headings view since they must surely be related to brainstorming? Maybe make pinch-in behave as today, with a long list but the user can re-order it and make pinch-out go to concept mapping? The question I have to ask myself is if this is best thought about–and presented as–a simple list in a document, in-text or as a separate view. I think that the historical people, projects and concepts can be usefully mapped somehow and since they need the documents from which they are cited, this will be tied to citations but much of the other concepts do not have such a striking need for a spatial view. In other words, the citations view is useful and does not need the other elements, a simple annotation for this view, not a glossary or anything else. This is why the pinch-out should be grounded in citations and have the option for specific ‘annotations/headings/explanations/concepts’ listed so I propose the pinch-out shows citations in a list, which can be flipped to timeline and the user can double click to add such text and this text can be connected to a local glossary simply by giving them a Get Info window for further information and exported as a Glossary section at the back of the document and linkable as ° from anywhere in the document on reading. Or not. A glossary in the document itself will be a parallel and useful thing but the text here should not need to be linked in the first instance. 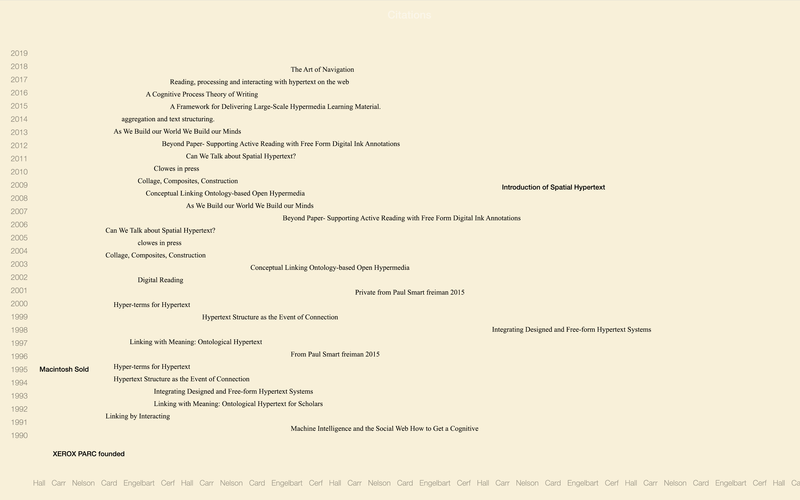 The pinch-out gesture results in a view with all cited documents listed in a single column. So how can we build a system where the main aim is to allow the author to provide a multidimensional view of the concepts they are discussing in the word processing view, with reference to the citations affecting the concepts being connected? I had a discussion about whether the glossaries should be integrated here but decided against it.